There’s a small store in a tiny town just a few miles north of New Hope. A store with a deli where they make wonderful soups, sandwiches, and other delectable items. This is the Carversville General Store, now run by Chef Max Hansen with the name: the Max Hansen Carversville Grocery (though we all continue to call it the Carversville General Store). Every morning, locals (and lucky cyclists) line up to get one of his famous breakfast sandwiches or homemade doughnuts. Those “in the know” get the bagel w/cream cheese and Max’s smoked salmon which will spoil you for all others! Those that prefer something meatier often walk away with the Haring Brothers sausage, egg, and cheese breakfast sandwich. Haring Brothers is one of the last great butchers in the region, and their sausage is the real deal. Only the best for Max and his happy patrons. At lunch time, you better call in your order or you’ll be waiting. Contractors and locals alike descend upon the store to get one of his delicious sandwiches or lunch specials. Check out the menu and you’ll see why. This ain’t your corner deli! If you don’t know Max, you should. His family has a long history in the area, which shows in his love and support of local organizations. He is much more than a caterer and entrepreneur, he, and his wife Andrea, are some of the most active philanthropic business owners in the region. You can find Max, his staff and his food at almost every fundraiser in the area. 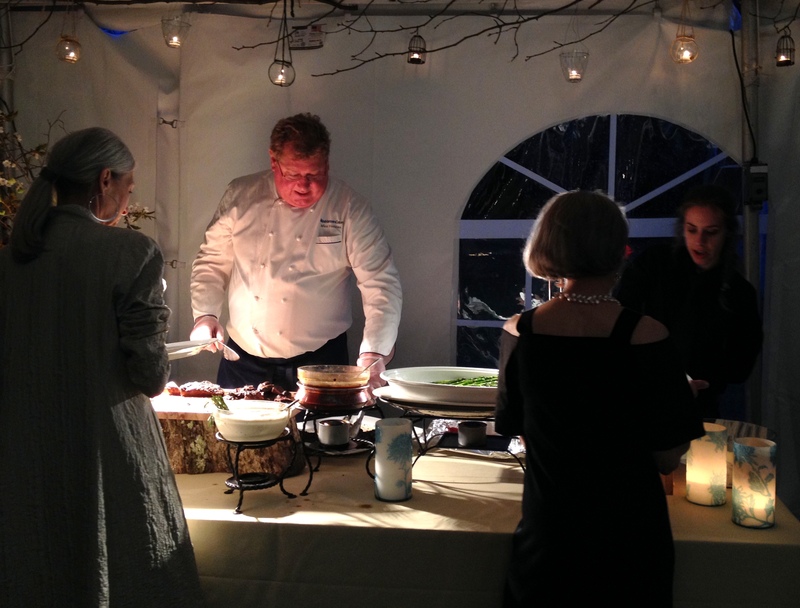 Thousands enjoy his generosity and delicious food at these events. In spite of his success, Max is a humble man who still works hard at these events – you’ll often find him sweating the details and carving the meat to ensure that everyone enjoys their meal. While Max is known for all of his great food, it’s his smoked salmon that really gets people drooling. Max makes what many consider the best smoked salmon in the country. It’s his passion. From his website: “Max’s love of salmon led him to create his own line of smoked salmon and to author the best-selling cookbook, Smoked Salmon, Delicious Innovative Recipes (Chronicle Books, 2003).” Clearly, this is a man who *knows* salmon like few others! And we’re lucky enough to have him right in our backyard. He truly is one of our hidden gems. Thanks for all you do, Max! By the way – if you’re looking to get a taste of Chef Hansen’s salmon, he’ll be appearing at the Stockton Inn as “Guest Chef” on Wednesday, June 3, 2015. Here’s the menu for this one-of-a-kind event.